The Alexander Ramsey House was built from 1868-72, while Ramsey was serving in the U.S. Senate after his years as governor of Minnesota. Three generations of the Ramsey family lived in their St. Paul home. When the Ramseys first moved to the Minnesota Territory, they lived with Henry Sibley and his wife for a month, and then above a saloon. Their first house was built in 1850, on the same property as the current mansion. While Ramsey served in the Senate, he and Anna lived in Washington, D.C., and Marion attended boarding school in Philadelphia. Mrs. Ramsey wrote to her daughter in 1866, "Papa and myself rode over to Georgetown. I was astonished to see so many beautiful fine grounds. Papa made the sensible remark: he wished he owned such a home; how he would enjoy it: I wonder if we all would not also." Six months later, they contacted St. Paul builders Leonard & Sheire. The Ramseys always intended to build their dream home, like the mansions they had seen out East, and after Anna's father left them some money and Alexander made a sizeable fortune in real estate, they were able to begin construction in 1868. The 1850 house was moved across the street and attached to Judge Horace and Mrs. Cornelia Bigalow's home. This structure no longer exists. 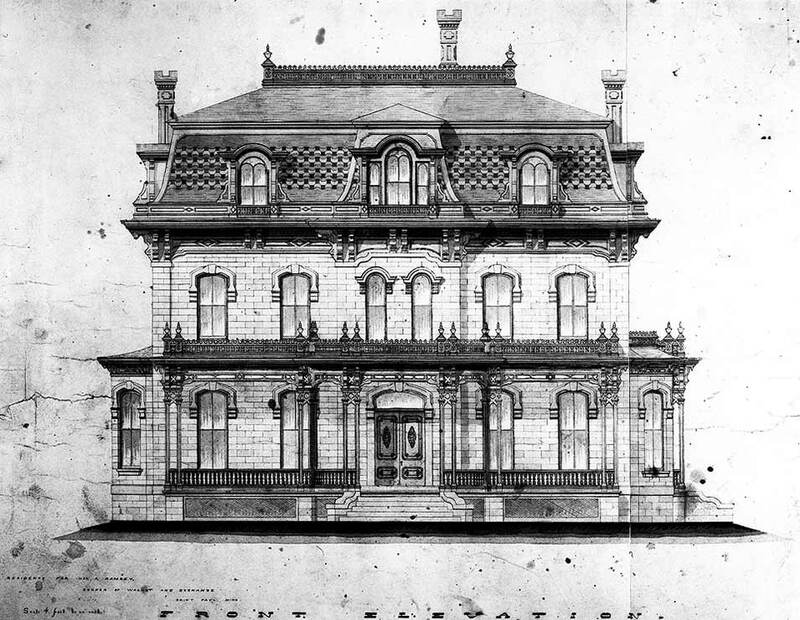 Architect Monroe Sheire submitted designs for the new house, and contractor John Summers supervised the construction. The new home was equipped with the latest technology — hot and cold running water, gas lighting, and hot water radiators. As construction neared completion, Anna Ramsey visited the A.T. Stewart department store in New York to buy new furnishings for their home. Her purchases almost filled two boxcars. The Ramseys and 19-year-old Marion moved into the new house in September 1872. The elegant home was the site for numerous social gatherings, including the 1875 wedding of Marion to Charles E. Furness of Philadelphia. Marion moved back into the home in 1882, and her three children were raised in the home. Alexander Ramsey died at home in St. Paul on April 22, 1903. His granddaughters, Anita and Laura Furness, never married and lived in the house until their own deaths in 1959 and 1964, respectively. Anita and Laura thought their grandfather was very important to Minnesota history. They always intended for the house to become a museum, so whenever they updated the house to more modern standards, they saved the original fixtures so they could be re-added into the house. One thing that remained, though, is central heat (the house originally used radiators). The granddaughters left the house and all its contents to the Minnesota Historical Society, founded in part by their grandfather in 1849. Today, about 95 percent of the artifacts in the house are original. The Alexander Ramsey House was listed on the National Register of Historic Places in 1969.